Recently, I offered a first look at Audioengine’s $149 W1 Wireless Audio Adapter —a kit that contains USB audio transmitter and receiver units along with a power supply and a handful of audio cables. In that first look I described the W1 as a flexible music-streaming alternative to Apple’s AirPort Express Base Station ( ). What makes it flexible is its ability to stream music not just from a computer—which is required by the AirPort Express—but from any device with an audio-output port. The W1 is made up of two USB modules—a transmitter (called a “Sender” by Audioengine) and a receiver. 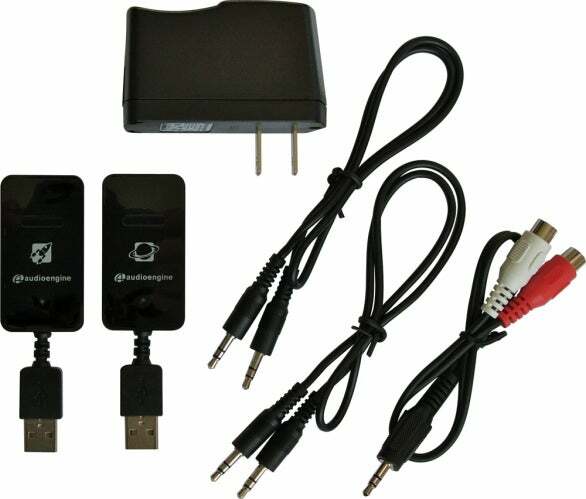 In addition to bearing a male USB connector, each module has a mini-plug jack—the Sender uses this jack for audio input and the receiver uses its for audio output. Each module also hosts a blue LED that indicates when that unit is paired with another, and a button for initiating such a Senders/Receiver pairing. Start playback on the device attached to the Sender and the audio plays through the speakers you’ve connected to the receiver. Any sound that would normally be played from the speakers attached to your computer or other audio device will be transmitted to the receiver. So, for example, if your email application is open and bleeps every time a new message is delivered, you’ll hear that bleep through the speakers attached to the W1 receiver. If you want to hear only iTunes audio, an AirPort Express has an advantage over the W1 in this respect. On the other hand, if you want to transmit all your computer’s audio, the W1 does just that; the AirPort Express requires you to install the third-party Airfoil 3 ( ; $25) on your computer. In either case, when using the W1 you’ll want to be careful about background applications that make sound. In most cases, you can control audio volume with the device connected to the Sender. For example, if you’ve connected the Sender to your computer, moving the volume slider up or down in iTunes or adjusting your computer’s volume level will change the volume output of the receiver. The exception is when you’ve connected the Sender to a true line-level audio output, such as the one on older iPod docks; when using a line-level output, you’ll need to control volume level using the speakers or stereo system to which the receiver is connected. In the preceding scenario I’ve described a setup you could create with a $99 AirPort Express Base Station. Yet useful as an AirPort Express may be, it’s no help to you if you want to step outside a computer-to-speakers environment. For instance, suppose your computer and its accompanying iTunes library is downstairs and you’d rather not run from floor to floor to choose new music. With the W1 Sender attached to an iPod your music is available in the palm of your hand (although the Sender would still need to be tethered to a power source). Or perhaps you’d like the soundtrack of the movie on your iPhone to play through external speakers across the room. iTunes won’t stream a video’s soundtrack via AirTunes because the audio and video would be out of sync. (Airfoil 3 does allow streaming a video’s soundtrack in sync, however.) The W1 doesn’t suffer from such syncing issues and will play transmitted audio in perfect harmony with your iPhone or iPod’s video. Or maybe you’d like to stream music from your stereo receiver in one room to powered speakers in another. This setup is a bit trickier because you need a power source on each end. In such a configuration you’d plug the transmitter into Audioengine’s included USB power adapter, plug that power adapter into a wall socket, and then connect the transmitter to an audio output jack on your receiver—a Tape Out jack, for example. Unless you’re using speakers that include a powered USB port—such as the previously-mentioned A5—you’ll need a second USB power adapter to provide juice to the receiver unit. Fortunately you can use Apple’s now-optional-except-with-the-iPhone power adapter, or any other USB power adapter, for this purpose. Since my first look, I’ve tested the W1 with a variety of computers and compared its performance to an AirPort Express. In terms of delivering an uninterrupted stream of music, the W1 bests the Express because it doesn’t have to deal with network issues. When I used AirTunes with a 1.25GHz PowerBook G4 (which contains an 802.11g AirPort card), if there was a lot of network activity, audio playing through the AirPort Express stuttered or stopped, particularly when playing streaming audio from a source such as iTunes’ Internet radio. The W1, as a straight transmitter not tasked with any variety of network chores, kept on ticking regardless of what my wireless network was doing. The W1’s range wasn’t an issue in my tests. Audioengine suggests that the W1 can broadcast up to 100 feet. That range easily allowed me to place my laptop anywhere in my house—even on another floor—and the music continued to stream without interruption. One area where the AirPort Express dominates is in digital output. You can connect a TOSLINK cable (with mini-TOSLINK plug) to the AirPort Express’ audio port and string that cable to a receiver’s digital-input jack to get a pure digital connection from Base Station to receiver. The W1’s receiver unit offers only an analog signal. It’s a perfectly fine-sounding signal, but analog-only nonetheless. The W1 Wireless Audio Adapter is a solid audio product, but one that’s not right for everyone. If your audio-streaming needs are confined to moving music from your wireless-networking-equipped computer to a set of speakers, an AirPort Express Base Station will do the job for $50 less than the W1 (plus provide a host of other useful networking features). But if you need more from an audio streaming setup—to stream music from your iPod or iPhone, or from a stereo receiver here to speakers over there—the W1 is a worthwhile way to go.